One downfall of working overnights is that my sleep-time usually corresponds with mass times. This means I have to cut my sleep time short in order to make it to mass. But being one that likes my sleep I have a tendency to hit the old snooze button until the last possible moment. It's amazing how much rationalization you can do with yourself while you are asleep ("I don't need to iron my clothes--that's ten minutes." "I don't need to shave." "I brushed my teeth last Tuesday.") The result of this is that we are commonly getting to church just in time for mass to start or shortly after. I know I'm not the only one who this happens to not only because of the stream of people coming in after the processional but because of the common question to Catholic talk shows, "What is the latest I can be for the mass to 'count.'" I know this isn't right. I know it's better to be early in fact. But in order to encourage myself to early to mass instead of late, I've developed these Top Eight Reasons to be Early to Mass." 8. Parking--the earlier you are to mass the better parking spot you will have. There is nothing worse than either parking at the very back of the parking lot or worse--the overflow parking lot, which is grassy and muddy and snowy and downright cruddy. But don't go crazy and get there really early because then you will just run into the traffic from the previous mass and you will just add to the confusion. 7. Catching Up--if you are there early you might run into friends and neighbors and have a few moments to catch up. Granted, in a perfect world you would do this after mass but we know that we have to rush out of there in order to get to the restaurant for lunch before the protestants get there. If you do get there in time to chit-chat please do it in the family room or outside and respect the other parishioners who are trying to pray in the sanctuary. 6. Choir practice--for a cop, "choir practice" is going out after work for some beers with your buddies (nothing like having a beer at 8 am) but here I mean actually watching the choir practice. Think of it like watching batting practice before a baseball game. You might get an preview of who is going to shine and who is going to stink up the joint that day. 5. Better seats--every good Catholic knows that you have to get to church early in order to get the good seats in the back of the church. 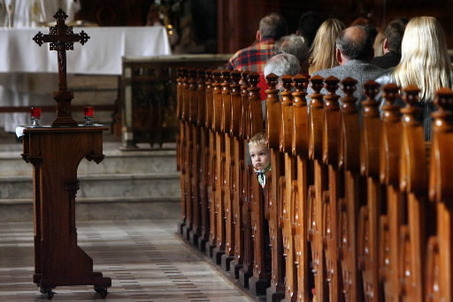 You know it's true--the front pew is always empty. We like to sit towards the back of church for a number of reasons. So get there early so you don't have to have that awkward encounter after mass with Father who happened to catch you daydreaming during his homily. 4. Save seats--speaking of seats, if you get get to church early you can save seats for others. Obviously, this is relative to the time of year and applicable to the rules of your parish. On a Saturday evening mass in the middle of Ordinary Time everyone is at the lake and the church is half empty so there is no need to save seats. But for that Christmas Eve midnight mass you may need to pitch a tent the night before in order to get in and save seats for the entire family. I actually use this one sometimes when one of the kids is fiddle-farting around getting ready. I'll take the other kids on to church and my wife will come later with the remaining child whenever she---errrr, I mean the kid finally gets ready. 2. Unwinding--as a father nothing stresses me out than getting the kids ready for mass. They act like it's a surprise every weekend. "We're going to mass!?!?!" Yes! We go every weekend!! Get our of bed and get ready!! Then you think you are leaving at a decent time and enter that time warp that seems to be at the doorway to the garage. You know the one--you are walking out of the house right on time but by the time you pull out of the garage you've lost fifteen minutes and are running late. Your blood pressure is up. The kids are fighting in the car and by the time you get to the church they are on your last nerves and you hope that your priest is an exorcist because you are acting like you are possessed. Get to church early and you won't be so stressed out and you will have time to get the kids settled in and you can unwind a bit. 1. Prayer--This is sort of like "unwinding" but goes a step further. When you get to mass early you are able to spend time in front to the Blessed Sacrament with Jesus in prayer. This is such a valuable thing to do prior to mass and I can't emphasize it enough. Put that kneeler down and pray. Thank God for bringing you to church safely. Ask Him for help that you don't get distracted at mass. Ask Him for help to understand the homily. Ask for the Holy Spirit to fill you and bring life to you. You wouldn't start working out without stretching would you? Think of prayer before mass as spiritual stretching. These are eight reasons and I'm sure you can think of more but is basically boils down that by being early to mass you are better prepared and in a better mental state to enter into the mass. Now, if you'll excuse me--I'm running late for mass!! Fantastic! Now, let's practice what you preached. haha...we have to try and get there early to be sure and get the front pew. We like sitting in front because the kids behave better! But we have several families who do it for the same reason...so if you want your kids to see, we have to get there early to get the front!! Love these! I need to do a post about how Easter Sunday seriously pushed my OCD buttons due to the overwhelming number of people who decided to arrive at mass early.